Fortunately there are others that take community commitment and activism to a higher level. A wonderful person named Lee Jackson is a shining example to us all as an Emery Village resident who helps to make this a better place to live. Jackson has lived in the same Emery Village home for 51 years. 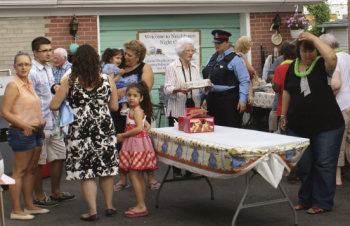 For 15 years now, Jackson has hosted a local community BBQ that is free for all to attend. 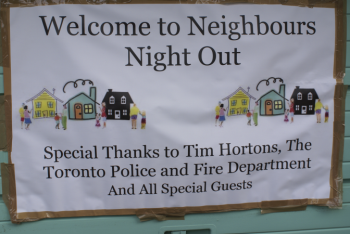 Young and old alike are invited to enjoy hotdogs, salads, donuts (thanks to Tim Horton’s and Ralph Shepherd), candies, coffee and cake. 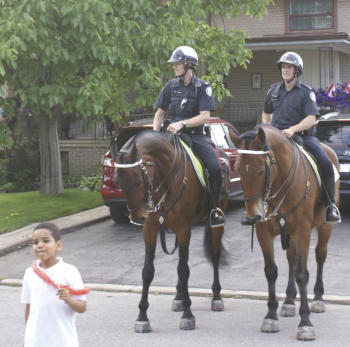 In addition to food we saw many 31 division officers lend their support along with two officers from the mounted horse division. Doris Roy was clowning around for her second year and was a fan favorite by the dozens of young children that attended. May and Sadie dropped by, one in their eighth decade of life and one in their ninth (neither is admitting who is the youngest!). 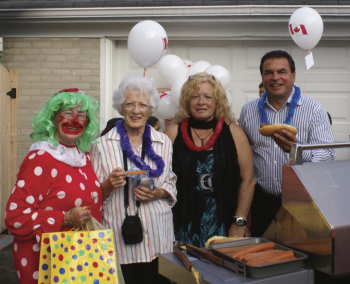 In case the hotdogs were overcooked by our Ward 7 Councillor, Giorgio Mammoliti, the boys from the local fire department kept a close watch on the grill while enjoying the festivities all the same. Young Jennifer is the head of the BBQ event advertising department and created the cool sign (top right). Donna and Terry Jackson (son of Lee) assist with the cooking chores and have a chance to sample their fine work. Our heartfelt thanks goes out to Lee and her many friends that helped out this year. Lee says that she hopes to see everyone again next year!